Of course unless your birthday is today (September 03), then you’re going to have to wait until September 07, 2011, when Atomic Robo: Ghost of Station X #1 arrives in stores. Since you have nothing better to do right now, take the jump and get an early review of the upcoming issue. Previously in Atomic Robo: A long time ago Nikola Tesla created an atomic powered robot. That robot was granted U.S. citizenship, and dedicated himself to action and science! SCIENCE! Astronauts are stranded in a crippled space station and no one can get to them in time except for Atomic Robo and the Action Scientists of Tesladyne! One of the best things about the writing of this series, is Brian Clevinger takes the best from the fringe sciences and turns it into a compelling story that might actually be feasible. Robo and crew need to find ways to get into space with seven hours of prep time, and though Clevinger could have spent the entire issue focusing on the action part of getting Robo into space, I’m particularly pleased that a large portion of the issue is Robo and the Action Scientists sitting around talking. WHAT!? Sitting around and talking? How the hell can that be interesting? Believe me, Dear Reader, we’ve barely scratched the surface of all the characters running around Tesladyne Island. Clevinger is able to give each character a voice, and make them interesting without going over the top – and he makes it seem natural at the same time. Of course there are moments when the issue does devolve into the absurd, like the opening exchange Robo has with a certain Steve over a certain device that looks an awful lot like an iPad. 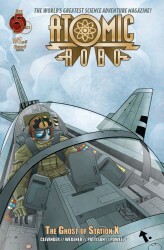 While each volume of Atomic Robo can stand on its own as a complete story, this issue does feature several characters from previous volumes, including the two bumbling Action Scientists from Atomic Robo and Other Strangeness, and the son of Sparrow from the Dogs of War volume. Do you need to read those previous issues to know what is going on? No, but considering the high praise this series constantly receives, why wouldn’t you? With each volume Scott Wegener’s art style improves more and more. This issue is the best to date, as the artist fills each panel with details. And you really want to pay attention to the little details as sight gags and references to other sci-fi properties continually appear in the background. This issue features the previously mentioned iPad, the armored bunny robot from Sucker Punch, the Wardenclyffe Tower (which really needs to be the focus of an upcoming arc), Worhol paintings, and a phone booth in the frozen wastes of Norway. Once you read the issue, you’ll want to go back and reread everything again and again to catch all the little details that Wegener adds to the world of Atomic Robo. 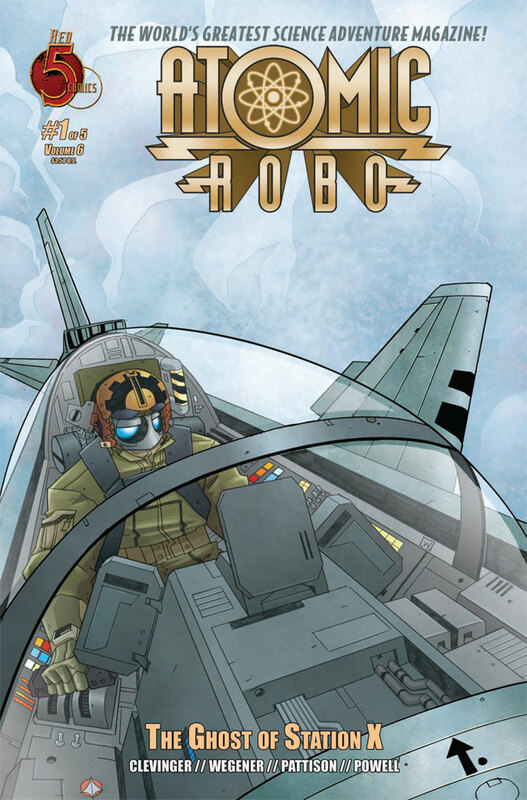 I’ve been reviewing and praising Atomic Robo since its debut in 2007. I know I sound like a broken record every time a new issue comes out, but this is the BEST book out there – nothing compares to the adventures, the hijinks, fringe science, and humor that goes into the writing and art. The good news is people are listening. Every day I get new email or Twitter messages from people who finally decided to pick up the book, and want to thank me for the recommendation. 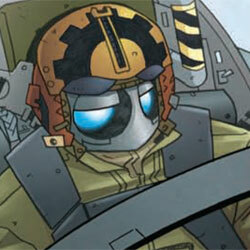 Atomic Robo: Ghost of Station X #1 is worth picking up. Do it now, before it is too late. Don’t wait for the trade. Run to your local comic book shop and demand you copy today! Atomic Robo: Ghost of Station X #1 earns another 5 out of 5 Stars. Yup. That’s what I get when I try to work when The Boy is in the room. You have made me want to go and get these all now, I have started listening to Major Spoilers from the start and you have had nothing but love for ROBO.